Back in March of this year, I wrote a piece on this blog entitled Lie Down With Dogs, Get Up With Fleas in which I bemoaned the inevitable ruin that comes when the world of working terriers is invaded by wannabe dog fighters and and badger baiters. That post noted that some 17 months earlier I had written a piece entitled Honey Pots and Trolls in the Land of Eire in which I had noted that someone in Ireland had gotten on the boards to bash a piece I had written two years earlier (now more than four years ago) about the old Irish "strong dog" tests and the potted histories that you commonly find for all Kennel Club dogs, including the Glen of Imaal terrier. I warned what I suspected: a "honey pot" operation was in operation, and it was designed to harm the legitimate world of the working terrier by trying to associate it with dog fighting and badger baiting. Sadly, I was right, and the result has not only been busts in Ireland, but also bad press on the international front as well. Perhaps now is a good time to review my original March 2005 post, in which I quite succinctly noted that Baiting Dogs Are Not Hunting Dogs. It seems this is a point that still needs to be stressed and underlined. The confusion in some minds stems from the fact that shortly after the turn of the 20th Century, some show-ring pretenders in Ireland tried to suggest that Ireland's overlarge turnspit, fighting, and cart-guarding dogs were once used for genuine field work. That's not quite true, is it? Those Irish Kennel Club dogs were always far too large to actually go to ground, and so "artificial" work had to be cocked up for them. And the work, to put a point on it, was a joke. But don't take my word for it: You can see for yourself by watching this 1923 video clip. Here is the famous (or infamous) Teastas Beg and Teastas Mor in action! At the "minor trial," we see a couple of rabbits released, and a bunch of confused dogs sniffing around on the ground. Some terrier trial! 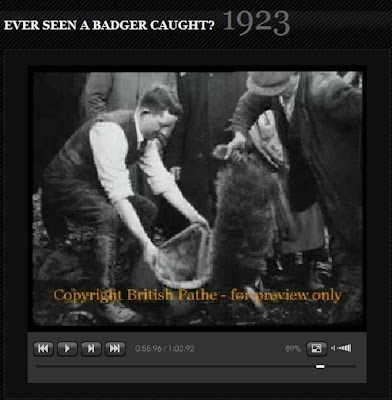 At the "major trial," we see the true "work" of these over-large Irish dogs: Badger baiting with a live badger in a smooth wooden den liner or barrel. This is pretty far from genuine terrier work, isn't it? And what does genuine terrier work of that era look like? The good news here is that we do not have to guess, as here too we have a film clip, also from 1923, this time of properly-sized working terriers going to ground. The dogs go in, the badger is dug to, and in the end it is bagged to be moved to a new location where it can do no harm. Are the dogs wrecked? No. Is the badger maimed? No. Is their confusion and chaos at the dig? No. This is real terrier work, and you will notice there is no "strong dog," "pull dog" or "hard dog" nonsense in evidence. These men are not show-ring pretenders, get-rich-quick dog dealers, or wanna be tough guys displaced from the world of fighting dogs. These are real terriermen, and this is what real terrier work looked like in 1923 -- and what it still looks like today, albeit with a much smaller entourage and clothes that are not quite so fancy. ** Red Badge of Courage? really enjoyed reading this post, there are many misconceptions about digging and baiting, in my opinion draw dogs are used by weak men who dont want to get there hands dirty, or simply enjoy seeing animals suffer. every point you have made is a good one.